Whether the kids are outgrowing their rooms, the home business has grown and taken over common living areas, or residents just aren’t happy with the home’s size or layout, this is a question that requires a good deal of consideration. Here are some points to ponder before deciding if moving or improving would be a better investment. Some things, like specific neighborhoods or school preferences, your budget, quality of life, and proximity to family or work can weigh heavily when it comes to deciding whether to stay put or move on. If you love the spot you are currently in, it makes sense to renovate your current home to your liking, even if would be more costly then purchasing a different home. After all, money isn’t everything. House hunting can be challenging, and If you have spent any length of time in your current home, chances are you have customized it to a certain degree to fit your needs and preferences. Will you be able to find those special features in a different home? If not, you may want to consider renovating your existing home so you can keep what you love and change what you don’t. Otherwise you may end up renovating your new home and compounding your expenses. Before deciding to sell or upgrade, consider the return on investment with both options. If you are leaning towards upgrading your home, it’s important to research the types of renovations you want to do. Many home upgrades won’t result in a higher sale price and will barely recover half of their initial expenses, while other key renovations will recoup almost all their upfront costs. On the flip side, if you want to sell your home and purchase another one, determine if you will live in the new home long enough to recover upfront costs. Experts say that is takes around seven years to recover those initial expenses. Most of Phoenix is currently in a seller’s market, so if that’s where your home is located, you may profit more from selling than you would if you renovated the home to include the features you are looking for. However, if you are in love with your neighborhood and luxury home prices are rising in your area, it might make more sense to stay put and renovate. After all, if your home has risen significantly in value, chances are everyone else’s around you has too. An experienced real estate agent can help you determine the current market conditions for North Central Phoenix, as well as the Arcadia and Biltmore neighborhoods. How Big Are the Renovations You Are Considering? Adding an in-law suite is manageable, but turning that two bedroom into a four bedroom with an additional garage is an extensive renovation and may not be worth the hassle. In many cases, a long, involved renovation can be costlier and more frustrating than moving! If you would rather not live in a construction zone for an extended period of time, you would be better off selling and buying a new home that fits your needs. Will You Overbuild in Your Neighborhood? Your home will be significantly larger than the others in the neighborhood. You are doing a renovation that will result in little value for resale. Your renovation takes up significant portions of your yard and brings you into close contact with your neighbors’ homes. You plan on moving within the next ten years. Your house is so large that the shade it casts lowers the energy bills for the homes around you (just kidding). You get the idea. While it may be tempting to expand and renovate to your heart’s content, it can cause headaches when you do sell your home down the road, as the priciest homes in a neighborhood are typically more challenging to sell. You may even end up slashing the price to get the home sold—erasing much of its equity. If you aren’t sure if you are over-improving, consult a Phoenix realtor who is familiar with your neighborhood to get his or her opinion on which renovations will add value for resale and which ones won’t. If you are not tethered to your current location for any reason, the decision to renovate or move can come down to the numbers. Take a look at current listings to see what homes you are interested in and how much they will cost. Factor in agent fees, moving expenses, and other associated costs. Then get a couple of estimates from contractors for the renovations you are considering. Which makes more financial sense? Whether you choose to renovate or move, you can live in the home of your dreams. 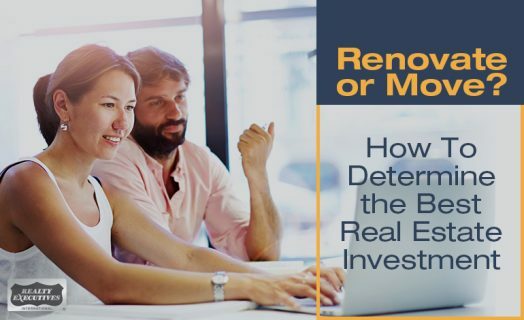 Using these points, you can make a wise decision on which option would be the best real estate investment. Still unsure? Contact Thomas Osterman, a top buy and sell real estate agent in Phoenix. He has an intimate knowledge of Phoenix communities and can help you make an informed decision on whether or not to list your home. Looking for a top real estate agent for selling homes in AZ? Thomas Osterman has over fifteen years of experience helping homeowners sell their homes in Phoenix and surrounding areas. His marketing expertise and personalized approach help clients sell their homes as quickly as possible for the best price. Give him a call today at (602) 466-1846 to get started.